Nebraska offensive line coach Greg Austin may or may not have an ESPN Insider subscription, but he’s aware that he made the site’s list of 40 best college coaches and staffers under the age of 40. Adam Rittenberg found plenty to like in Austin’s coaching experience and connections. 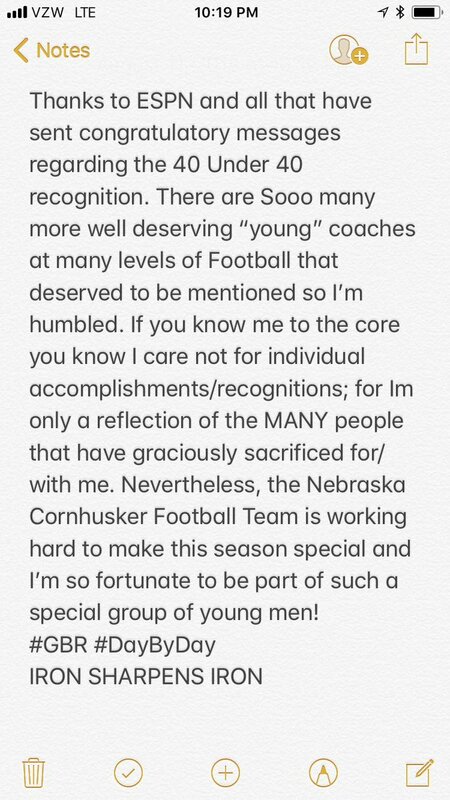 Austin, who followed Scott Frost from UCF, shared his reaction to making the list on his Twitter account. Thanking all those who have sent congratulations his way and revealing what the recognition means to him. Andrew covers Big Ten football for Saturday Tradition.